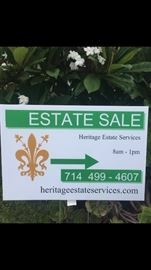 AddressThe address for this sale in La Habra, CA 90631 will be available after 9:00am on Thursday, May 9th, 2019.
driveways. Local sales tax will be charged on all items unless we are provided with a valid paper copy of your resale license. DIGITAL COPIES ARE NOT ACCEPTABLE. You MUST bring your valid California Resale Permit with you, or you WILL be charged tax. NO EXCEPTIONS! As per our clients request we do not offer pre-sales. You will be entering the property at your own risk. There is NO restroom available at this sale. NO EXCEPTIONS. Absolutely no food or drink in the home. NO purses or bags allowed. Bring your wallets and use the shopping baskets that we provide. NOTE: If you purchase large items or furniture, you must move them. We do not provide movers or assistance moving your items out of the house. We do not lift, load or move heavy items.You must also bring your own tools, hand truck, etc. We do NOT provide tools. Large items may not be movable until the end of each sale day. Check with us before you purchase. Local delivery may be available after the sale for a fee. We provide shopping baskets for you to use while shopping, some bags and limited amounts of wrapping. Please bring your own boxes. Due to increased theft, no large purses or bags will be allowed in the sale. Please do not call, email or text asking for prices. We do not give out prices prior to the sale. You must attend the sale for pricing and information. We are excited to have been selected to host this great sale for a wonderful family. Additional information and photos coming soon. We appreciate your business and look forward to seeing you at the sale. Antique, vintage, Mid- Century & contemporary furniture & decor.